Landscape of Wadi Rum, a protected desert wilderness in southern Jordan. The map shows Jordan, a desert country in the Middle East with a short coastline at the Strait of Aqaba. The landlocked country is situated east of the Jordan River, on the Arabian Peninsula. 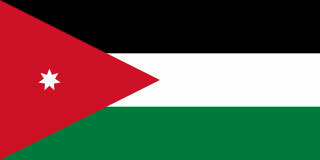 The nation's official name is the Hashemite Kingdom of Jordan. The kingdom is bordered by Syria in the north, by Iraq in the northeast, by Saudi Arabia in east and south; the Jordan Rift Valley of the Jordan River separates the country from a portion of the Palestinian territories (the West Bank) and Israel. With an area of 89,342 km², the country is slightly smaller than Portugal, or somewhat smaller than the U.S. state of Indiana. Jordan consists mainly of a plateau with elevations between 700 and 1,200 m. The tableland is divided into ridges by valleys and gorges, and a few mountainous areas. The East Bank (east of the Jordan river), as the opposite of the West Bank, is also known as Transjordan or the Transjordanian Highlands, with a mostly desert landscape. Oases and seasonal water streams irrigate the country. Jordan's elevation extremes are Jabal Umm al Dami, the country's highest mountain with an elevation of 1,854 m (6,083 ft); its top is covered with snow, the country's lowest point is below sea level, the Dead Sea at -420 m (-1,378 ft). Jorden has a population of just over 10 million people (in 2019); capital and largest city is Amman; the official language is Arabic. 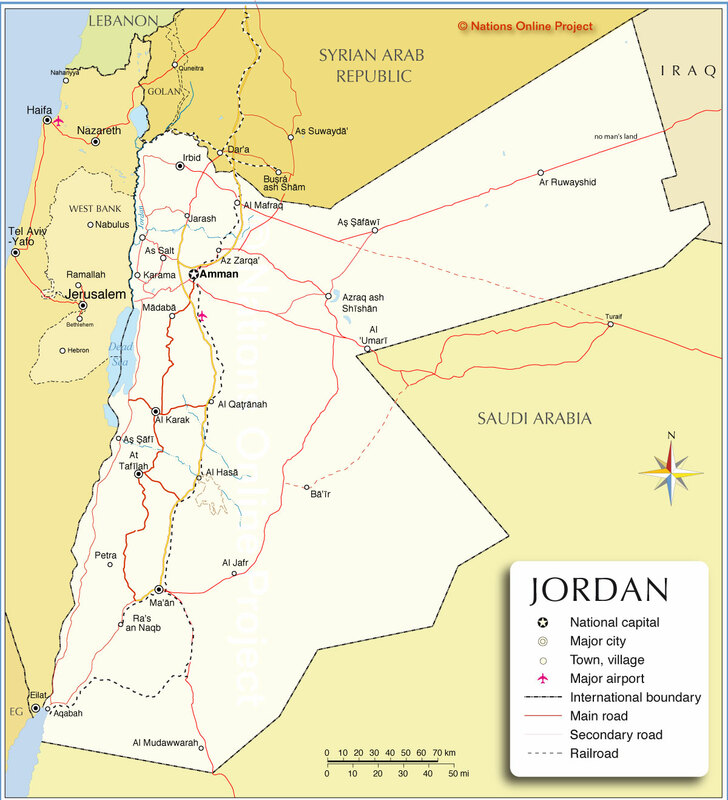 The map shows Jordan and surrounding countries with international borders, the national capital Amman, governorate capitals, major cities, main roads, railroads, and major airports. Aerial view of Amman, the capital city of Jordan. 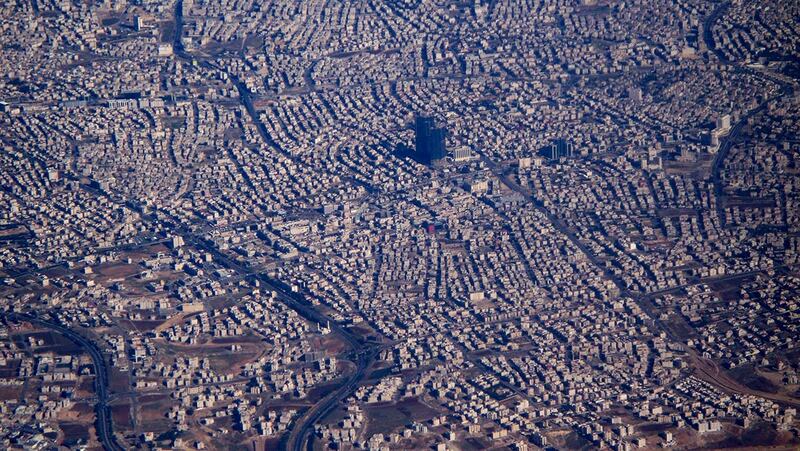 Amman, capital of Jordan and the center of a large continuous urban sprawl. The city is home to several ancient ruins, like the pillars of the Roman Temple of Hercules and the 8th-century palace complex from the Umayyad period. Irbid, the kingdom's second largest urban settlement lies in northern Jordan. The university town is also a main industrial and administrative center. Zarqa, the Blue City, is part of the extended metropolitan area of Amman; it was founded at the beginning of the 20th century by Chechen immigrants. Nearby is Zarqa camp, the oldest Palestine refugee camp in Jordan. Between Amman and Zarqa lies Russeifa, an industrial city and part of Amman's wider metropolitan area. Al Quwaysimah, administrative a city, lies in the southeastern part of the urban sprawl of Amman. Ajloun, capital of the governorate of the same name, a hilly town with about 10,000 inhabitants is known to be home to the 12th-century Muslim Ajloun Castle. Aqaba, Jordan's only coastal city, is located on the Gulf of Aqaba. The port city plays a significant role in the development of the nation's economy. Ajloun, Al Hasa, Al Jafr, Al Jizah, Al Mudawwarah, Al Umari, Amman (commercial center and national capital; pop. 2,000,000), Aqaba (largest city on the Gulf of Aqaba and Jordan's only coastal city), Ar Ruwayshid, Azraq ash Shishan, Ba'ir, Irbid (second most populated city; pop. 600,000 ), Jarash, Karak, Karama, Ma'an, Madaba, Mafraq, Mazraa, Petra, Qatranah, Ras an-Naqb, Safawi, Safi, Salt, Tafilah, and Zarqa (Az Zarqa, third largest city and a major industrial center; pop. 800,000).